Craig Hetrick is a native of Wilmington, Delaware and began studying drums at age eight under the direction of his father. In high school he toured Europe with the American Youth Jazz Band. He earned a B.M. degree from the University of Delaware and an M.M. from Indiana University. His major teachers have included Gerald Carlyss, George Gaber, Jim Chapin, Chris Williams and Alan Abel. Before joining the Indianapolis Symphony Orchestra in 1992, Hetrick performed and recorded with the orchestras of Baltimore, Delaware and Evansville and toured the Midwest as a drummer for Perry Como and Johnny Mathis. Hetrick is on the faculty of Butler University and is a visiting professor at Indiana University. 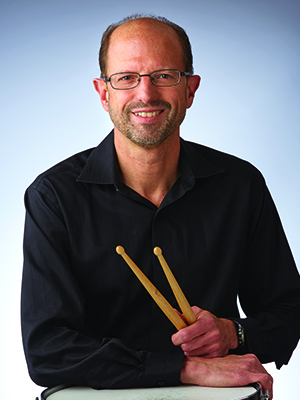 He has presented percussion clinics at Butler, Ball State and Indiana universities, as well as the 2004, 2009, and 2011 Percussive Arts Society International Conventions. Recently Hetrick has delved back into the local jazz scene, performing at the Jazz Kitchen, the Chatterbox and Players Pub in Bloomington. His published composition, Tip of the Andes, has been performed throughout the United States and Europe. Hetrick is the father of three grown daughters. Hetrick is an endorser of Pearl/Adams instruments, Vic Firth sticks, Evans heads and Sabian cymbals.